When most of us think of Morocco, we imagine camel trains making their way through bone-dry sand dunes in the middle of the Sahara Desert. While it's true that scenes like these can be found in the east of the country near Merzouga, the truth is that, in general, Morocco's climate is tropical rather than arid. When one considers that the northernmost tip of the country is only nine miles from Spain, it comes as no surprise that the weather in many areas of Morocco is essentially Mediterranean. As in any country, there is no hard and fast rule about the weather. Temperatures and precipitation levels vary greatly depending on region and altitude. However, there are some universal truths—starting with the fact that Morocco follows the same seasonal pattern as any other northern hemisphere country. Winter lasts from November to January and sees the coldest, wettest weather of the year while summer lasts from June to August and is often scorchingly hot. The shoulder seasons of fall and spring usually offer the best weather and are generally some of the most pleasant times to travel. Along the Atlantic coast, the difference between summer and winter is relatively minimal, thanks to cool breezes that temper the summer heat and prevent the winters from becoming too cold; however, seasons have a much greater impact on the interior parts of Morocco. 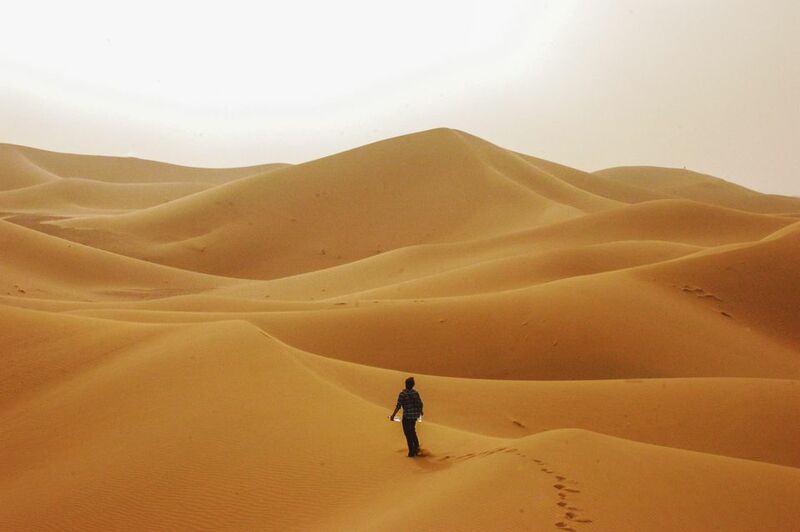 In the Sahara Desert, summer temperatures often exceed 104 degrees Fahrenheit (40 degrees Celsius) in summer but may fall to near freezing during winter nights. In terms of rainfall, the northern part of Morocco is considerably wetter than the arid south (especially along the coast). Meanwhile, the Atlas Mountains, located roughly in the middle of the country, have their own climate where temperatures are consistently cool due to elevation, and in winter, there's enough snow to support sports like skiing and snowboarding. Located in Morocco's interior lowlands, the imperial city of Marrakesh is one of the country's biggest tourist attractions. It is classified as having a semi-arid climate, which means that it is cool during the winter and hot during the summer. The average temperature for November to January hovers at around 53.6 degrees Fahrenheit (12 degrees Celsius), while June to August temperatures averages around 77 degrees Fahrenheit (25 degrees Celsius). Winters can also be quite wet, while the summer heat is dry rather than humid. The best time to visit is in spring or fall when you can expect abundant sunshine and cool, pleasant evenings. Located towards the northern end of Morocco's Atlantic coastline, Rabat's weather is indicative of the weather in other coastal cities, including Casablanca. The climate here is Mediterranean, and therefore similar to what one might expect from Spain or southern France. Winters can be wet and are usually cool with average temperatures of around 57.2 degrees Fahrenheit (14 degrees Celsius); summers are warm, sunny, and dry. The humidity level at the coast is higher than it is inland, but the discomfort usually associated with humidity is tempered by cooling ocean breezes. Located towards the north of the country in the Middle Atlas region, Fez has a mild, sunny Mediterranean climate. Winter and spring are often wet, with the greatest amount of rain falling between November and January. On the plus side, winters are rarely freezing with average temperatures of around 57.2 degrees Fahrenheit (14 degrees Celsius). From June to August, the weather is typically hot, dry and sunny with average temperatures around 86 degrees Fahrenheit (30 degrees Celsius), making this the best time of year to visit Morocco's oldest imperial city. The weather in the Atlas Mountains is unpredictable and depends heavily on the elevation that you plan on visiting. In the High Atlas region, summers are cool but sunny, with temperatures averaging around 77 degrees Fahrenheit (25 degrees Celsius) during the daytime. Like Fez, the rest of the Middle Atlas region is characterized by abundant rainfall in winter and warm, sunny summers. In winter, temperatures frequently plummet below freezing, sometimes falling as low as negative four degrees Fahrenheit (-20 degrees Celsius). Snowfall is common, which makes winter the only time to travel if you want to go skiing. The Sahara Desert is scorching in summer, with daytime temperatures averaging around 115 degrees Fahrenheit (45 degrees Celsius). At night, temperatures fall dramatically—and in winter they can be positively freezing. The best time to book a desert tour is during the spring and fall months when the weather is neither too hot or too cold. Be aware, though, that March and April often coincide with the Sirocco wind, which can cause dusty, dry conditions, poor visibility, and sudden sandstorms. Spring is an extremely popular time to visit Morocco, thanks to pleasant temperatures and bright green landscapes you'll find all across the country this time of year. Additionally, while both May and April are considered rainy months, it's unlikely that you'll see too many rainy days whether you're visiting Fez or the Atlas Mountains. However, if you plan on visiting the Sahara Desert, sandstorms during the spring months can be quite powerful due to the Sirocco wind that blows through the region at that time. What to Pack: Remember to carry a lightweight umbrella to fend off the occasional storm, but otherwise you'll just need to pack a variety of pants, long-sleeved shirts, and maybe a light jacket or sweater to enjoy the moderately cool climate this time of year. Morocco's summer months are extremely hot but can be a little cooler along the coast, so you'll want to head there to get a break from the heat. Additionally, many interior regions can be much cooler in the mornings and evenings, so if you're traveling to the Atlas Mountains or Marrakesh, you should prepare for both hot days and cold nights. No matter where you go, though, there is very little rainfall during this season, which makes it great for planning a day trip to the beach or an afternoon hike. What to Pack: Morocco's mostly conservative dress-code holds true regardless of the season in which you visit. Women tend to wear tops that cover their elbows and are usually long and flowy, and hair is often covered or pulled back. Avoid wearing clingy tops or spaghetti straps, regardless of the season. Men often dress in Western-style clothing but don't regularly wear shorts. Pack a cardigan as nights and early mornings can be chilly. Fall in Morocco is mild and dry, with average temperatures hovering around a pleasant 70 degrees Fahrenheit, which makes this a popular time to visit destinations across the country. With plenty of daylight hours, warm temperatures, and relatively fewer crowds, fall is a great time for outdoor activities and sightseeing adventures. However, the frequency of rainy days begins to increase in late October and throughout the month of November. What to Pack: Long pants, long-sleeved shirts, and a light jacket are recommended as well as any climbing gear you'll need for visiting the Atlas Mountains or swimming gear you'll need for laying out by the sea. You may also want to pack clothing you can layer as evenings are significantly cooler for most of the country this time of year. Morocco's rainy season begins in November and runs through March, and parts of the country even get cold enough for snow to fall on the highest peaks. However, while this season is wet for Morocco, there's still just an average of two inches of rain per month. Christmas is a busy time to visit with hotels and other attractions booking up early, and the pleasant temperatures in the mid-50s attract a lot of visitors looking to escape the winter chill elsewhere. What to Pack: You won't really need a winter coat unless you're visiting the snowcapped regions of the Atlas Mountains, but it's advisable to pack a variety of sweaters, long-sleeved shirts, and overcoats to accommodate for the warmer days and colder nights. You may also want to pack a raincoat and should be sure to bring waterproof shoes, especially if you plan to spend any amount of time outdoors.